It is important to know the value of toys you buy. You will know what kinds of figures are more rewarding. You will get more profits than before. This collection can be full of enjoyment. It is also meaningful to have your own most favored World of Warcraft figures . Your investment will pay you back in the end. No matter what you decide to do with your figures, it is worth investing. You can sell them for higher expense as well as keep them as a hobby. The condition of the toys should be kept as good as what it is. The demand of keeping them is very high. The Walking Dead minimates are coming on pretty strong now. Wave 2 is out soon and will give us Michonne, Lori, Andrea, Amy, and Morgan. A surprise set also just came out and is exclusive to Amazon.com. The set contains Rick in his prison jumpsuit (sporting the bruises he got from his scuffle with Tyreese), a grimacing Michonne (her gritted teeth are the only difference from the Michonne we’re getting in series 2), and two fairly non-descript zombies (the box labels them “Zombie Roamer” and “Zombie Lurker”). I like this Rick figure. The details on his beat-up face are really nicely done. I’m excited to get the characters representing their prison days. Andrea will be in her prison suit as well, and there have been hints that wave 3 will be prison-heavy. New Minimates From The Walking Dead! Christmas is coming up fast and you’re running out of options. The Walking Dead fan in your life already has everything including the latest trade paperback , Telltale Games’ award winning video game … even that crazy zombie-head box set . So, what’s left? Well, it looks like Diamond Select Toys will release the second wave of their popular Minimates figures just in time for the holidays. As some of you may know, Series 2 was originally scheduled for November. But after a few delays, they’re finally ready to roll out later this month! It’s okay, everyone — the Walking Dead outbreak has been isolated! All of the infected have been sealed inside airtight blister cards, leaving us safe to admire them from outside their plastic prisons. Unfortunately, there are survivors trapped in there with them! 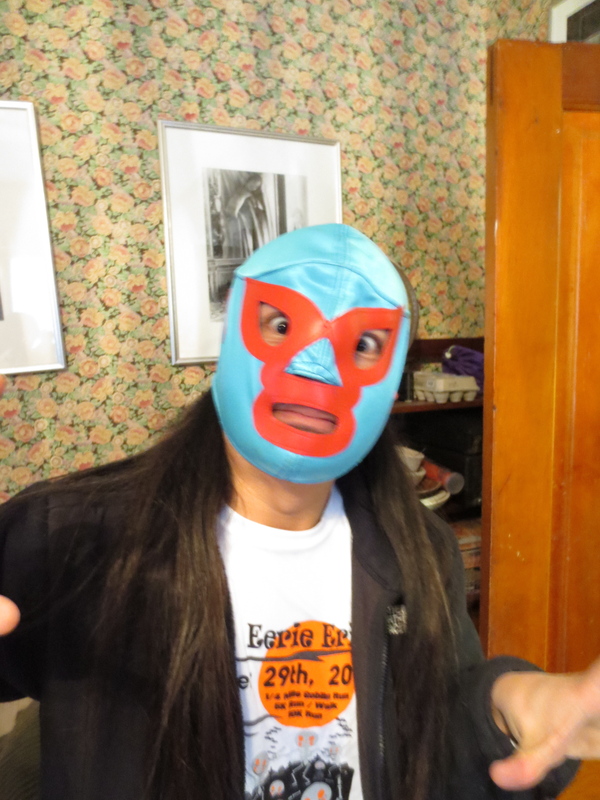 James, our employee and friend, modeling a Mexican Wrestling Mask. Don’t ask. FREE. The mask, not James. This is the part of the project I have been dreading. My kids have a really nice playroom but if there are too many toys in there, especially small action figures, they end up getting dumped on the floor and mixed in with the Legos. This says to me that they have too many toys, period. In an attempt to restore sanity to this house, I culled through the toys, organized them into baggies and put them in a box. Which has been sitting in my office for months. It has been there so long it is practically furniture now but I know how much work getting rid of that stuff is. Lonny has assured me that many of the toys have value so I can’t just chuck them. Have you finished your shopping yet? How about the tree? Is it up? Mine isn’t…..eeeek! But I lost 4 days with the ‘cold that was totally unwelcome’ so I’m using that as my excuse. At least I’ve got MOST of the cards in the mail….I ran out of stamps…..I have to get more, dang! But I digress. This post is all about toys for the little boy munchkins in your life and I know I have a few in my life so I’ve been checking into these pretty closely in trying to decide who gets what. New Star Wars Bobbleheads ~ !!!! Most Really, Really Obscure 1980s/1990s Action Figures Yet! Jason Todd is the largest incarnation of the Red Hood, a character who has been both hero and villain since his first appearance, when he tried to steal the wheels from the Batmobile. He is also one of the set’s black pawns. The Zombie Hunter finds new targets, the Silence from Dr Who. Zombie Hunter is a custom mini-fig purchased at MCFC from EclipseGRAFX. The Silence are from Character building. Zombie Hunter last seen here. These are Mattel’s WWE Deluxe Display Stands. They are intended for WWE figures but honestly these can work with any figure series you decide to use them for. There are 2 types of display stands at different heights and you get 2 of each. Each oval section has a WWE logo and small peg that you can connect at the bottom of the left boot of an action figure it fits. You can stack them and create 3 different heights. Naturally, the more you buy of these the more crazy heights you can achieve. I decided to try these out with my Batman figures (back 2 rows) and they make my collection easier to see. These are available at MattyCollector.com and wrestlingfigures.com. Go for about $20. 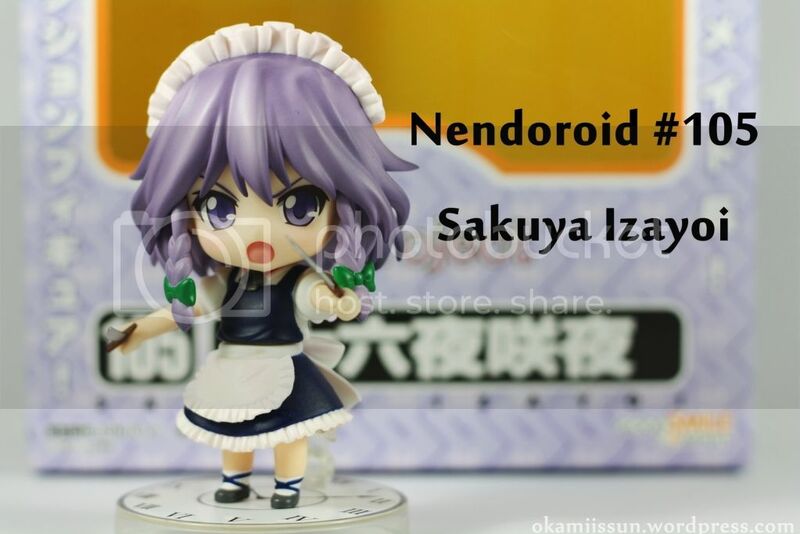 Megahobby is over and gladly nothing new was announced that I really want so I guess this is a god send of some sort. The only things of real note were prototypes painted or not. 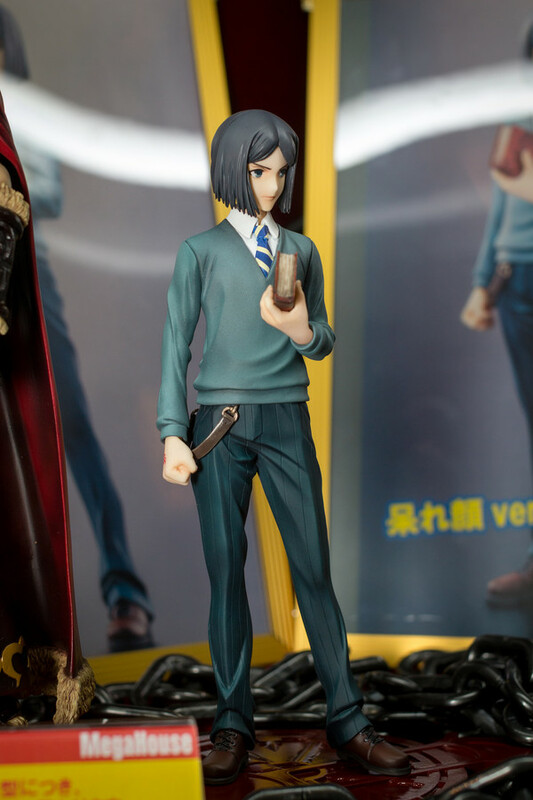 Last week I was talking about Alter’s Waver figure and this week we have Megahouse’s Waver to drool over. I’ll be straight I don’t like Alter’s version at all, to the point where I think it’s ugly however MH’s is everything I ever wanted in a Waver figure. Thankith to the ninja photographers! !